These Glutinous Rice Snacks made of sweet rice flour and filled with store-bought red bean paste. Generously coat the dough with sesame seeds before pan-fry them. It's that easy and tasted so good. Combine glutinous rice flour and salt in a mixing bowl. Gradually add the boiling water. Then add the vegetable oil. Gather the flour mixture and knead into a smooth dough. Roll the dough into a log and divide into 4 pieces/portions. Roll each piece into a ball. Then flatten it and fill with red bean paste. Gather the edges, pinch to seal and roll into a ball. 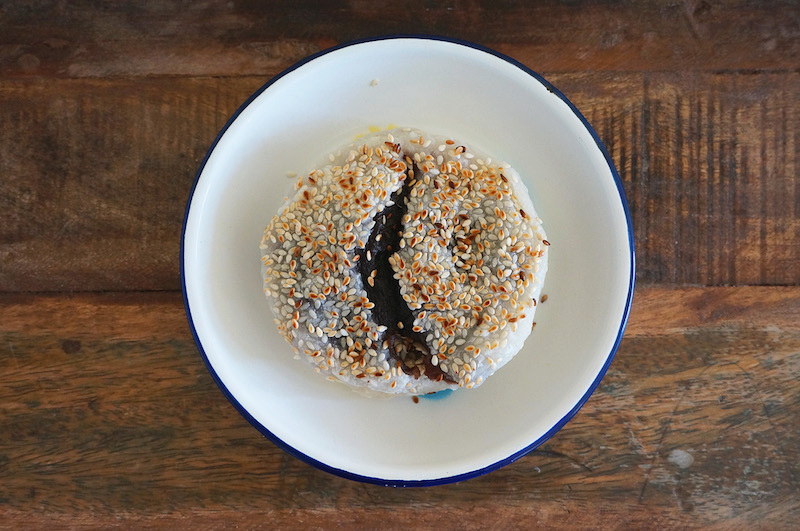 Place the ball on a plate of sesame seeds. Press down lightly to coat on both sides. When ready to cook, heat a lightly oil pan over moderate heat. Place the rolled snacks and pan-fry until both sides are golden brown and slightly crispy, about 8 to 10 minutes. Let the snack cool down before serving.